Airbus announced yesterday that Vietnam Airlines is planning to expand both its fleet of A350 aircraft and its route network — this time, to Los Angeles. The carrier signed a Memorandum of Understanding (MOU) with Airbus for 10 more of its A350-900 aircraft, which it has stated will first be made available with service between Ho Chi Minh City (SGN) and Los Angeles (LAX), making it one of the longest flights in the world at 8,169 miles. Last year, Vietnam Airlines became the first East Asian airline — and the second carrier in the world — to operate the A350 XWB, one of the most innovative aircraft in the sky. Currently, the airline has four A350s in service, which are used on routes like Paris (CDG) to Hanoi (HAN), which TPG flew earlier this year, with another 10 on order for future delivery. For a full recap of TPG’s flight on Vietnam’s A350, check out the full TPGtv episode, below. 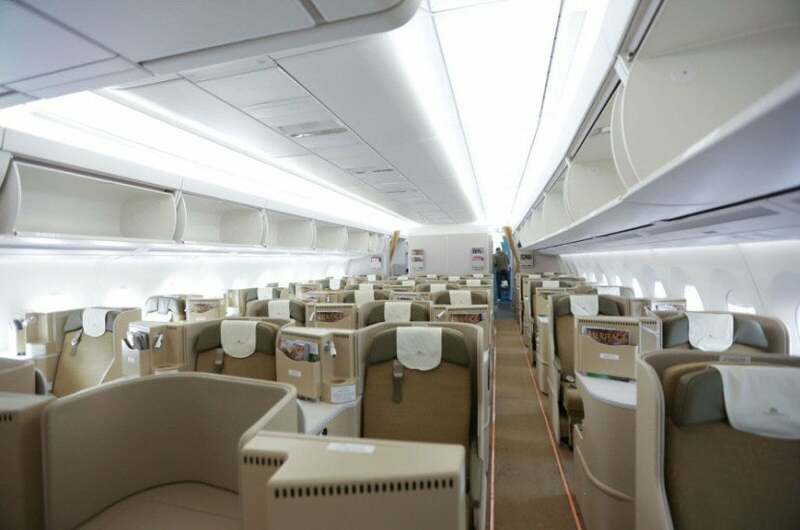 Vietnam Airlines’ A350-900 has a three-cabin layout, including business, premium economy and economy sections. The business-class cabin is comprised of 29 flat-bed seats in a 1-2-1 configuration that have 42 inches of pitch and are 21 inches wide. The premium economy cabin is comprised of 45 seats in a 3-3-3 configuration that each have 38 inches of pitch and are 18 inches wide. Finally, the economy cabin is comprised of 231 seats in a 3-3-3 configuration that each have 32 inches of pitch and are 18 inches wide. Vietnam’s A350 business-class cabin is comprised of 29 seats in a 1-2-1 configuration. There’s no word yet on when we could see this deal finalized and when service on the route would begin. The addition of Los Angeles to Vietnam Airlines’ route network would make it the latest Asian carrier to propose a nonstop US route, something that’s only been made available because of new fuel-efficient aircraft.